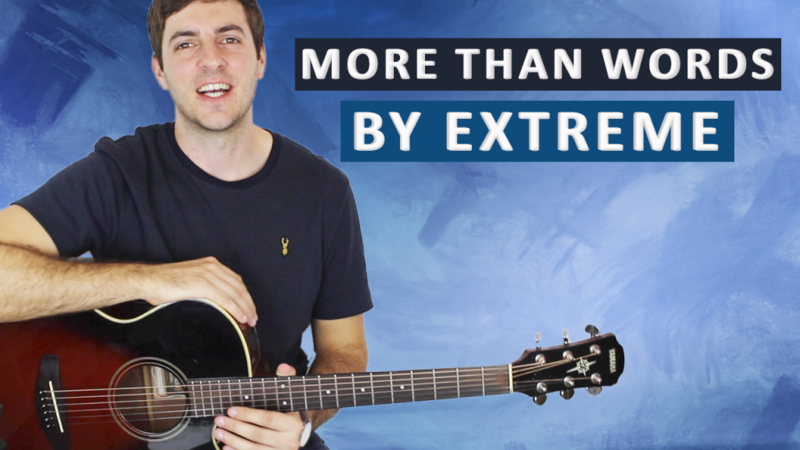 Scroll down for full video lesson (with tab) of More Than Words by Extreme. More Than Words was written by American funk-metal band 'Extreme' and it appears on their classic album 'Pornograffitti'. Extreme wrote the song in 1991 and it's gone on to become the band's biggest hit, reaching number one in the U.S.A, Canada, New Zealand, Belgium and The Netherlands. Nuno Bettencourt is the guitarist for Extreme and a shredder at heart, More Than words is certainly a detour from his usual style of playing. More Than Words is no. 35 on my Top 60 Fingerpicking Songs of ALL TIME list. If you've not seen the list be sure to check it out and sign up to my weekly email lesson. That way you won't miss learning any of these great fingerstyle songs. Although simple compared to a lot of Extreme's songs, More Than Words can still be very awkward to learn for many players. The chords are easy enough, but it's the rhythm that is a little odd at times, and the slightly unorthodox fingerstyle technique Bettencourt uses. Many of the chords are anticipated and come in on the '&' counts instead of on the beat, this will likely take some getting used to. You don't have to adopt the fingerstyle technique that Nuno uses, you can of course just use your regular style of picking the strings. You want to really focus on getting the introduction secure before venturing into any other area of the song. Work on getting the percussive taps very accurate and make sure all the changes are in the right place. The verse begins with the same progression as the intro, then more chords are brought in after. This section is a little easier than the verse I'd say. Really enjoy your lessons. I’m having a hard time putting the three sections of this lesson together. It would be very helpful if you would do a complete play through of your songs in with your lessons to demonstrate there flow. Hey Paul, really glad you’re enjoying the lessons. Yes I would like to do that, my main concern is stepping over the copyright boundary, which is very easily done. That’s also the reason why I don’t score the pieces from start to finish. The last thing I want is for all this to be shut down… Maybe I’m a little paranoid but there’s a fine line between what is copyright and what’s fair use. Hey Paul, just uploaded a play through of the song. Hope it helps you out. Hey, the honest answer is practice. If you can’t do something on guitar the only reason why is because you haven’t done it enough times. It’s a frustrating reply I know but it is true. My old teachers used to give me the same answer and it would wind me up. Now I can see that they were just being honest. Just keep on going!